Os grid reference: HY 2433 0042. In a rugged and rather windswept glacial valley just north of Dwarfie Hammars Plateau on the island of Hoy, Orkney, is an isolated block of stone called The Dwarfie Stone, or Dwarfie Stane, thought to date back to 3,000 BC and, which is in fact a burial chamber (passage grave) hewn out of a massive sandstone block that has two chambers and an adjacent blocking stone. There are other boulders lower down the slope which may have formed an alignment to the Dwarfie Stone. The island is 19kms (12 miles) in length and 10 kms (6 miles) wide, the highest point being Wards Hill (479 metres) at the north-side. Quoyness settlement is 2 miles east of Dwarfie Stone, and Rackwick settlement 4 miles to the west, while the nearest islands are: Graemsay, north-west side, Farra, Flotta and Cava to the east. Orkney Island is the next biggest island a few miles further to the east. The Dwarfie Stone is a massive block of Old Red sandstone measuring over 8 metres (28 feet) in length, 13 feet wide and 6 feet high at one end tapering to 2 feet at the other end, which is probably a glacial erratic boulder that has been used by Neolithic people living on the island 5,000 years ago. They may have used it for shelter, but in the main they ‘saw fit’ to carve out the boulder and bury their dead in the ‘sanctuary’ of its rock-hewn chambers. There are two small cells or chambers running off from the short passage-way, the south chamber still bears the toolmarks from the hands of the people who carved it out. Above the passage is a strange opening, like a chimney, that used to link up in some way to the entrance blocking stone, something that looks as if it might have inspired film-makers! The square shaped entrance is 3 foot square with the passage being over 7 feet long to where the two cells have carved-out places for burials that would have been difficult to get into by anyone with an ordinary stature – hence the name, according to J Gunn in his book ‘Orkney The Magnetic North’ 1941. A roughly-hewn stone, shaped like a stopper at one side, lies in front of the entrance and would have almost certainly acted as a blocking stone, rather than any close-fitting door. This smaller stone measures nearly 2 metres by just over 1 metre. Further down the slopes (10-20 metres) below Dwarfie there are a number of boulders scattered around, one in particular is at HY2437 0038. These are perhaps marker stones or outliers aligned to the rock-cut burial chamber back up the steep hillside. Unfortunately, there is some 18th and 19th century graffiti on the Dwarfie Stone, some of this in Latin and Persian, much of it from the Victorian age. There are are said to be signs of a Neolithic agricultural settlement, dating to 3,500 BC in the nearby Whaness Burn just south of Quoyness settlement, according to the author/photographer Charles Tait in his book ‘the Orkney Guide Book’ 1999. Gunn, J., Orkney The Magnetic North, Thomas Nelson And Sons, Ltd., London, 1941. Tait, Charles., the Orkney Guide Book, Edition 2.1, Charles Tait Photographic, St Ola, Orkney, 1999. Ancient Monuments Scotland, Vol VI, H.M.S.O., Edinburgh, 1959. 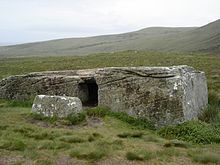 Categories: Burial Chambers, Rock-Cut Tomb | Tags: Dwarfie Stane on Hoy in Orkney, The Dwarfie Stone on the Island of Hoy | Permalink.